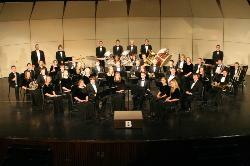 Known as the Bingham Wind Symphony, this ensemble is an advanced level performance group. The course provides opportunities to foster and refine musical expression through instrumental performance, analytical/evaluative skills, and aesthetic judgment. Study includes the care and cultivation of a beautiful tone, the ability to read music with fluency, the polishing of performance skills, esprit de corps, and responsible rehearsal habits. Students will have opportunities to experience the spontaneity of improvisation and the creative process of performing. Students will hone listening skills and their ability to analyze and critique music and music performances. Attention will also be given to relating their music experiences to the time and culture of the pieces they study, as well as to contemporary society. Membership is by audition in March according to ability and instrumentation needs. The Symphonic Band consists of mainly seniors and juniors, although some sophomores are admitted if their audition warrants it. Members are required to prepare and perform a solo or small ensemble piece for region and state solo festivals, and are also required to participate in a weekly sectional with their sections. The Symphonic Band participates in Fall, Christmas, and Spring concerts. The Band also represents the school at all Regional and State festivals. The Symphonic Band is reserved for those individuals who exhibit a dedication to their instrument and demonstrate this dedication by their advanced musical abilities. The two Bingham H.S. Pep bands exist to provide public support for the school's winter athletic program. During the basketball season, students in the Concert and Symphonic bands will be divided into two bands of equal instrumentation - the Blue Band and the White Band. These Pep bands will perform at home for an equal number of men's and women's Region varsity games. If teams continue into the post season, a volunteer group gathered from both bands will be assembled to play at any Sub-state and State games. These groups will perform music in the rock, pop, and dance styles.